Character. Cost: 2. STR: 3. 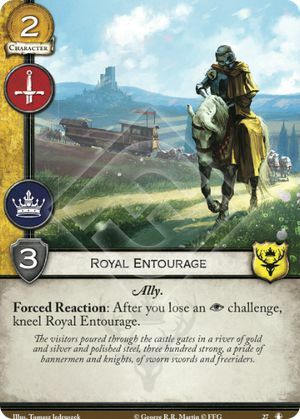 Forced Reaction: After you lose an challenge, kneel Royal Entourage. The visitors poured through the castle gates in a river of gold and silver and polished steel, three hundred strong, a pride of bannermen and knights, of sworn swords and freeriders. The Road to Winterfell #27.